Time to kick off pony introductions! I'll be making these playable characters in just 3 weeks so it's good to have an explanation of what I'm trying to get across out there. In order to turn these horsies into familiar faces I'll post a short description of each, where the name comes from, and what they can do. these won't exactly be ponipedia entries, but consider it a really rough draft that breaks the 4th wall. I'll be doing these 3 at a time as I get more sprites and solid designs to work with. As with everything else so far, things are subject to change at a moment's notice. Even the fully animated sprites may not be final. Get info on the Simber, Xenoir, and Sweet-Bot ponies below. Ability: Blaze | Contact with the pony may burn the foe. 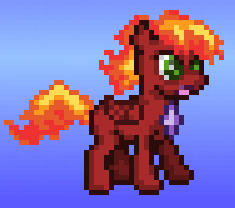 This is a feisty, Fire/Air class pony you'll meet early on in Battle Gem Ponies. It's useful for demonstrating how to mow down all the Plant and Bug ponies in the forest beyond the second town. I designed this one around the idea of being the player's pony, in contrast to the villain pony Zenoir, to get a feel for the game and create mock-up images. She's a bit influenced by the famous Rainbow Dash, but the idea for this pony came from the Firefox pony I see daily on my Desktop. This was the first time I thought about how the pony chest gems could look better if they were any random color that was easy on the eyes rather than matching the pony's accents. 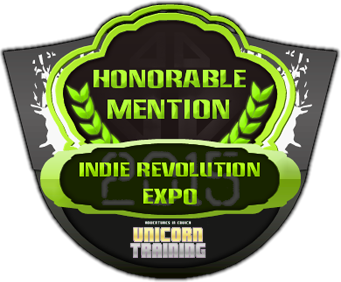 The green and purple came from messing with the Hue slider in Gimp, but it just looks so perfect. A cool thing I get to do with all of these is leave room for the imagination. You can only fit so many pixels onto these things so I need to design just enough to tell what every pony part is while also making each pony look different from the others. I don't need to worry about textures and details as much as the overall silhouette. Ability: Tricky | The pony's status moves always go first. 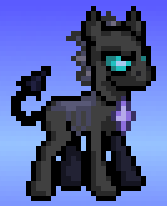 Xenoir is the baddest Dark pony on the block. It's also the first pony I ever designed. I was testing the size, shading, and angle I wanted and ended up using black, which made me want to design a villain pony. What started as a mix between Ponyta, Houndoom, and a Changeling started to get influences from Alien in my head. I imagined this this having a slick, impenetrable exoskeleton and tons of boiling poison inside. That's where the name comes from. A Xenomorph from the Alien franchise. To make the name shorter and more related to it's purpose I mixed in words for "dark" or "evil" and settled on "noir". I'm still playing with ideas for its class today. I feel like it should have a secondary class, but I also feel like it deserves the simplicity of Dark class weaknesses and strengths as a common goon enemy. I currently have it set to be able to learn a variety of Dark, Toxic, Chaos, and Bug class moves. Xenoir also has an ultra form, so I could always attach a secondary class then. The ultra form will have a long, thick, and deadly tail as well as noticeable fangs and a generally fearsome physique. 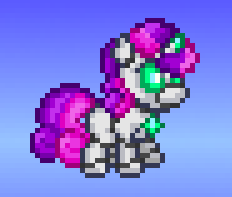 The Paragon Cartel leader is the only villain that uses this pony's ultra form in battle, and even the player won't have access to this pony until the villains are defeated. Ability: Explosion | If KO'd by a contact move, an explosion hurts the foe. This Steel/Esper filly was the first of the new ponies I got started on. She's based on the Friendship is Witchcraft parody of Sweetie Belle. I just loved the idea of a pint sized robot with incredible destructive power that only wants to love. I'm also caught up in the Five Nights of Freddy's craze and have seen lots of artistic depictions of animatronics that have a flexible feel. Looking at the sprite now makes me think of all the cool animations I could do. It may be wrong to pick favorites when balancing, but I think I like this pony the most so far. I'm really looking forward to animating her and choosing what her deadly Attack Mode poses will be. I'll need to decide where her rocket launchers go and what part opens up to reveal a laser cannon. outlines to match the shading scheme. Sweet-Bot will also have an ultra form of Steel/Surge class that can take advantage of the powerful electrical moves she can learn. The surge class also plays in because I was switching between Esper, Surge, and Magic for so long and eventually decided based on potential movesets. I noticed a 5 Nights at Freddy's aesthetic going on. So these make up the first three ponies going into the game. Next week I'll share the other 3, but for now I need the padding because there's not much to post until I get closer to the BYOC competition. 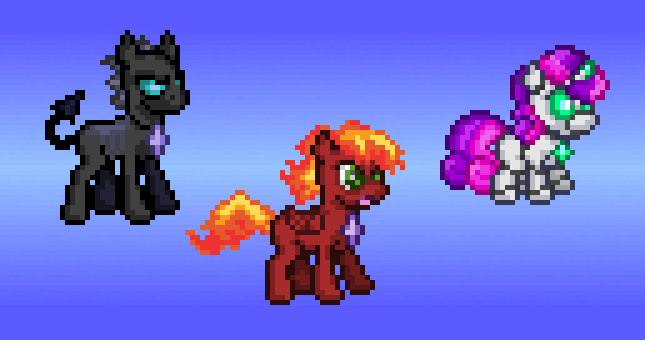 I hope you like these ponies as much as I do and look forward to using them in battle!